Signs at the bottom and the top of the pass indicate that only 4WD vehicles are allowed access, and one can imagine that it must be challenging even for these when it is wet or snowy. 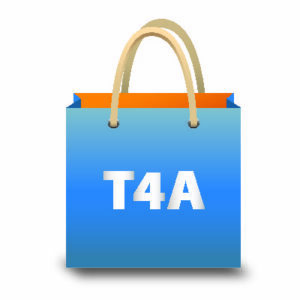 Indeed travellers have become snow bound as bad weather has suddenly encroached, only to recover their vehicles weeks later – so one should enter prepared with sufficient spares, food, water and warm clothing. Now the pass was dry, rough, rocky and slow, but not difficult to drive. 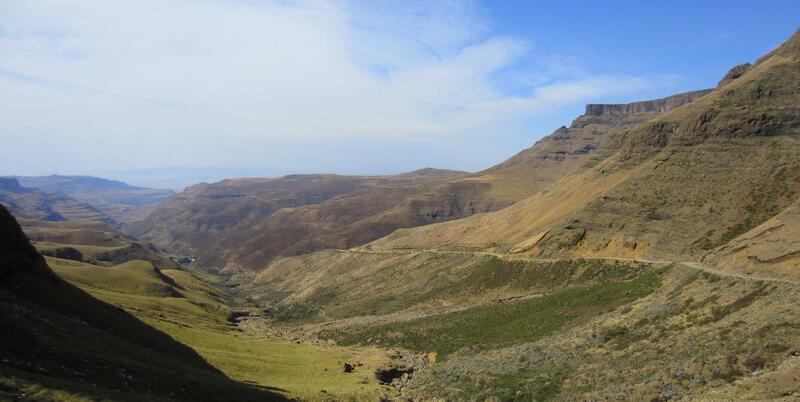 The bottom of Sani Pass. The views were, however, absolutely breathtaking both looking up the pass and back down to the valleys below. Looking back to the valleys below the pass. 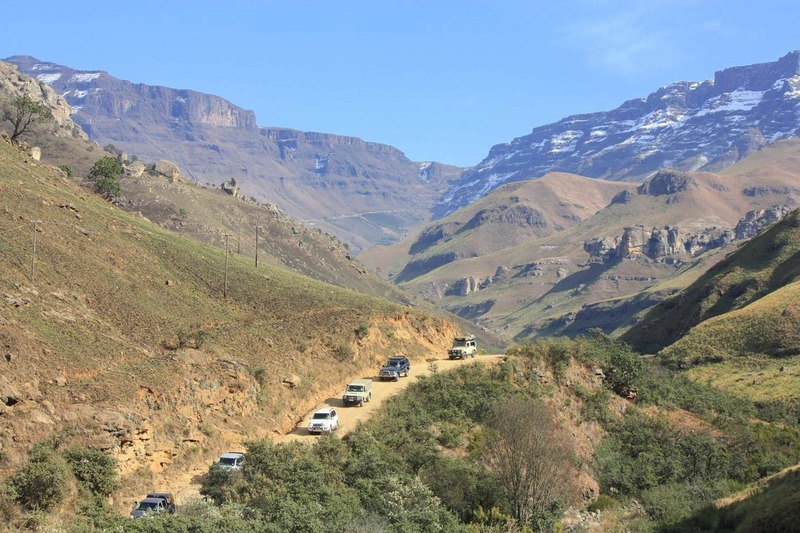 Vehicles coming down Sani Pass. 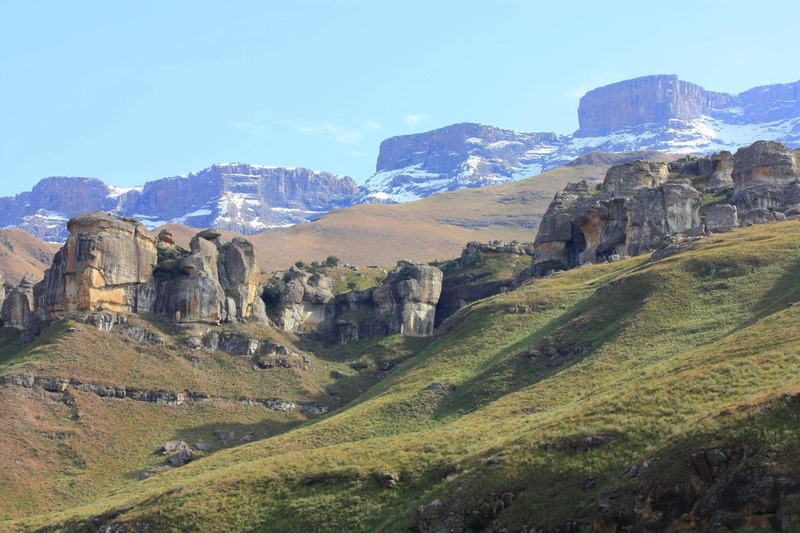 Even though I’ve heard a lot about Sani Pass, it took me totally by surprise. As we ascended, there were patches of snow next to the road and we passed by an impressive frozen waterfall, where snow melt flowing over rocks by day, froze again at night. Me in front of a frozen waterfall. The Lesotho border control is at the top end of the pass where immigration was surprisingly easy. We were stamped in without having to fill in any forms and only had to pay a R30 vehicle fee, without showing any vehicle registration papers. 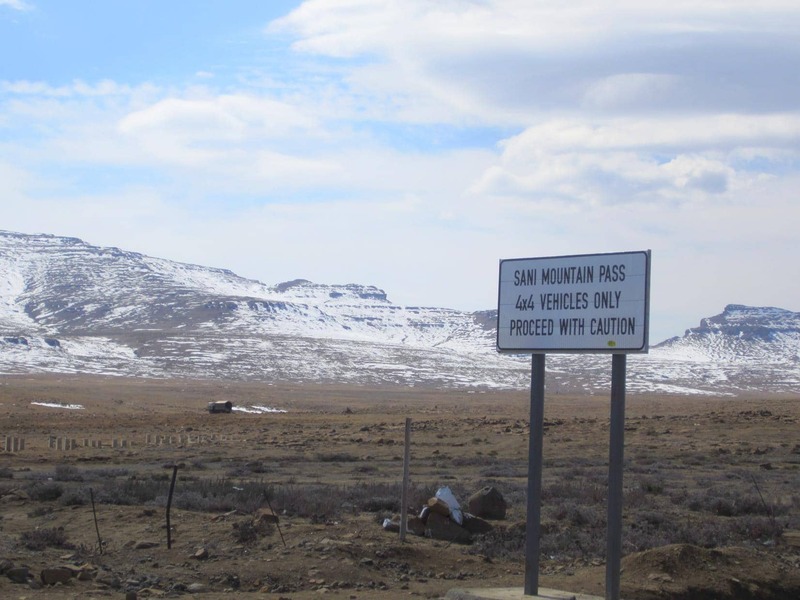 Notice at the top of Sani Pass. 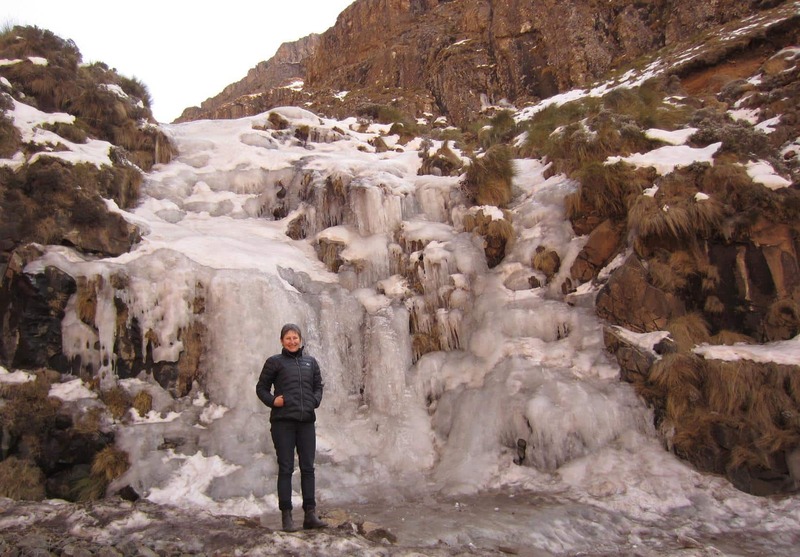 Very exciting for me, the top of Sani Pass was almost completely covered in snow and the wind that swept over the highest pub in Africa (at 2 874m) was icy cold. 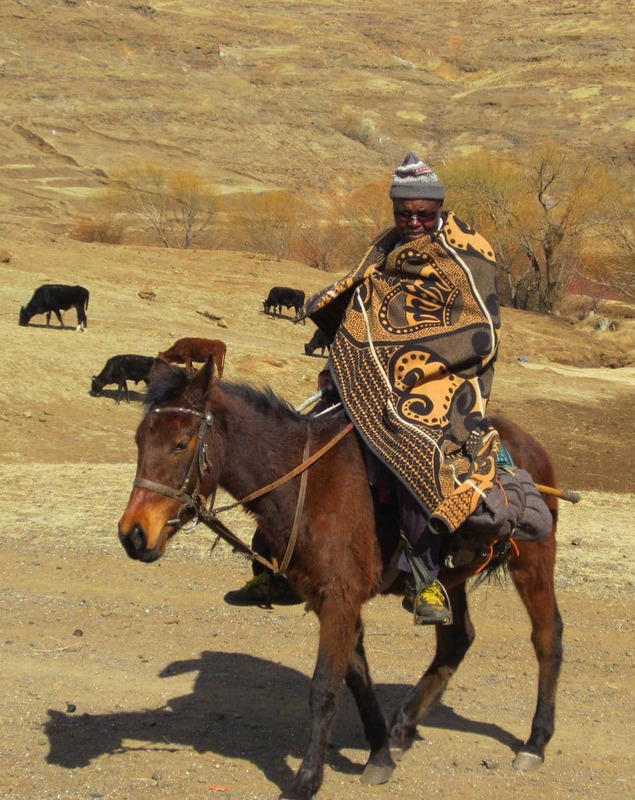 In recent years, Chinese construction firms have tarred a network of roads across this mountain kingdom and as we headed north-west on one of these, the newly completed A1, we could see traditional thatched roofed stone huts and their hardy herdsmen wrapped in blankets on horseback. Wash day in the highlands. 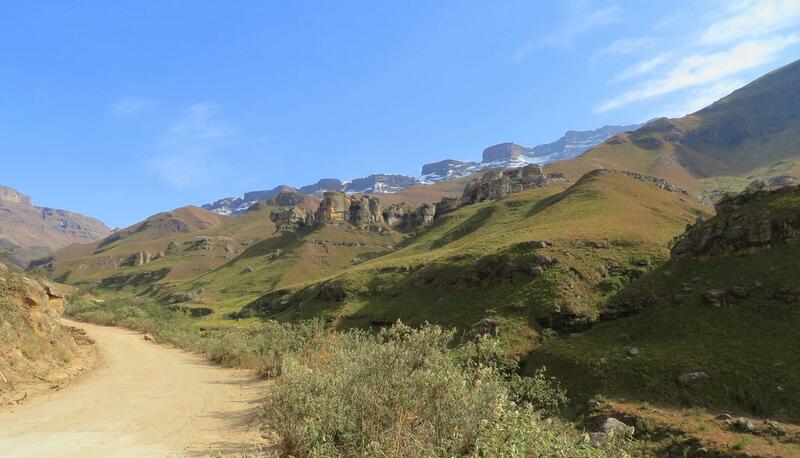 It was good to make our way slowly up and down the soaring slopes with their sweeping bends, where the snow gave way to golden brown grasses as we temporarily descended from the high ground around the Sani Pass. 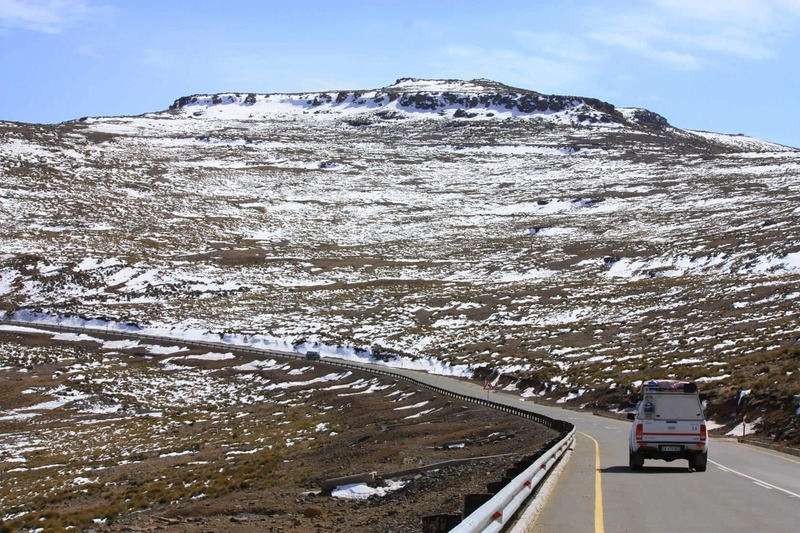 This part of Lesotho is rural, undeveloped and, apart from the snow, very dry at this time of year. 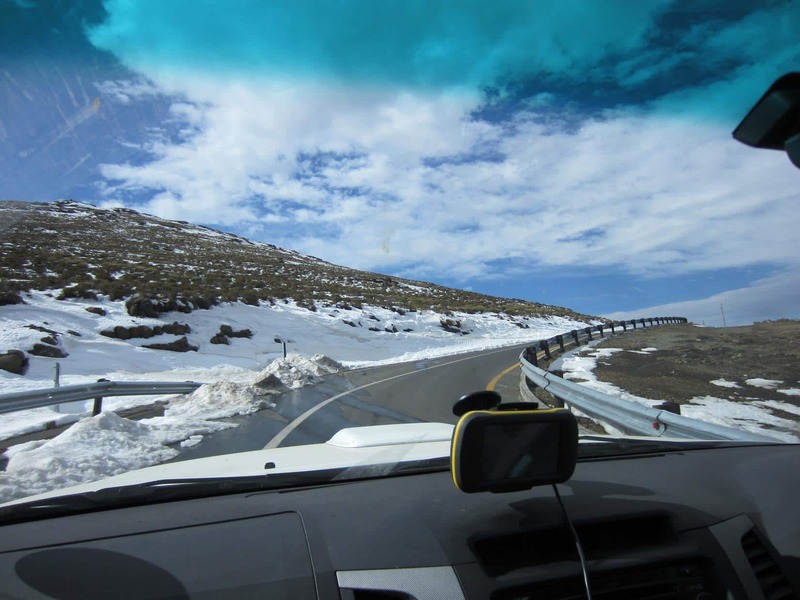 Next, as we approached the Maluti Mountains, with the road rising to heights of around 3 200m, the landscape turned into a white fairy tale world and at times one lane was still deeply covered in snow. We saw half frozen streams and frozen waterfalls next to the road as we headed for New Oxbow Lodge. This was the one night on our trip that we were not going to camp! 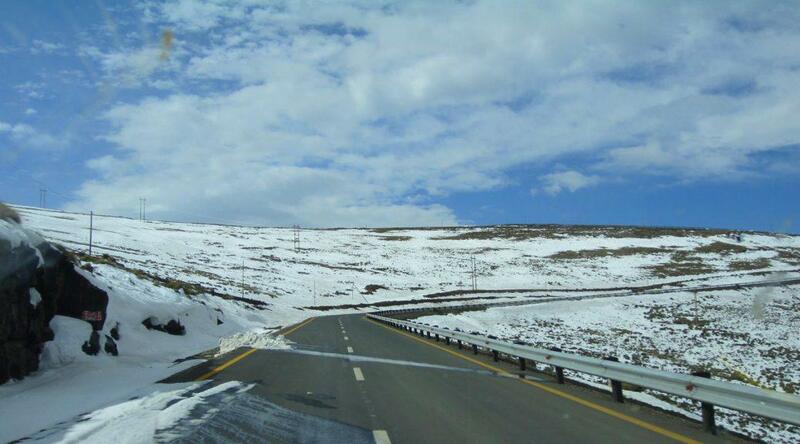 Reaching the snow of the Maluti Mountains. On the way we passed the Afriski Mountain Resort, one of the few such resorts in Africa, and we could see skiers gliding down the single, straight track. This run, which must seem quite simple to experienced overseas skiers, used to European and US ski resorts, still provided lots of fun for locals. Thick snow covering half of the road. The next morning we descended Moteng Pass to lower ground where we saw more signs of agricultural activity, although all the crops were harvested. The landscape which is dry and brown at this time of year, was dotted with houses amongst the beautiful sandstone rock formations. Fertile ground and beautiful rock formations. We left Lesotho at the Caledonspoort border post, in drive-through ‘McDonalds’ style. Without even exiting the vehicle, we had our passports stamped from inside a little window at the side of the border control gate. In spite of what I had read about rather extensive Lesotho border regulations, these were the easiest border crossings I have ever been through in Africa. With 7 000km to cover in our five week trip, we only skirted the eastern side of Lesotho, but our two day visit was well worth it. Next time I’d like to experience more of the natural beauty and culture of this little kingdom. 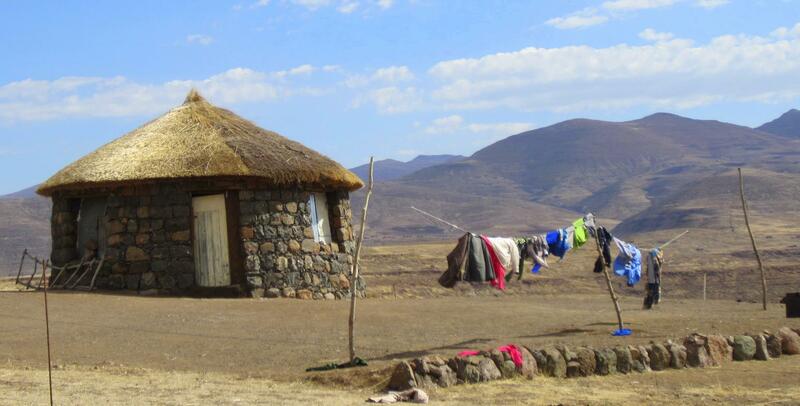 If you look at the Lesotho tourism website, you will realise that it has a lot more to offer! 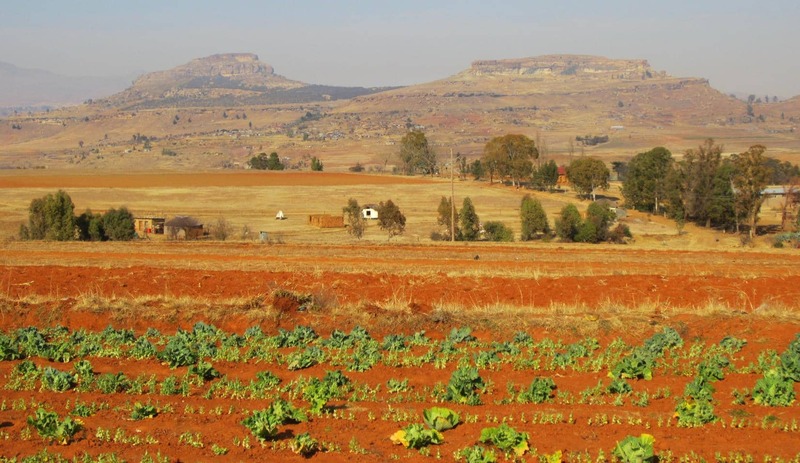 het julle oorgeslaap by Afri Ski of dit in een dag afgele en hoe lank ry n mens tot by Caledonpoort. Ons het by New Oxbow Lodge, wat baie na aan Afrikski is, oornag. Dit is aan te beveel. 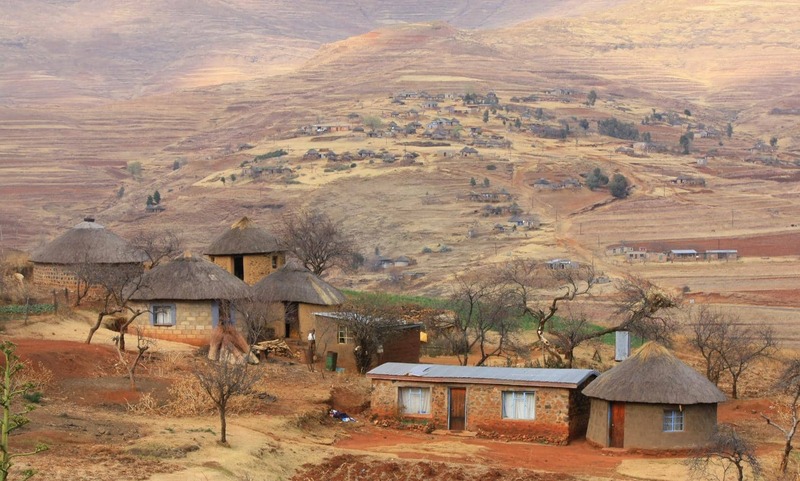 Ek sou reken mens benodig darem minstens een oornagstop in Lesotho. Vanaf New Oxbow neem dit sowat twee tot drie ure tot by Caledonspoort, afhangend van hoeveel jy stop. Jy het ons nou lekker lus gemaak vir n trippie Lesotho toe. Waar mik julle nou heen? Pas julleself op en ry veilig. Baie dankie Karin, ek wou dit in een dag doen maar sal nou oorbly en dit rustig vat.